After Wednesday night’s CNN special, Guns in America, it has become clear that Piers Morgan is one thrown chair away from being the newest Jerry Springer. 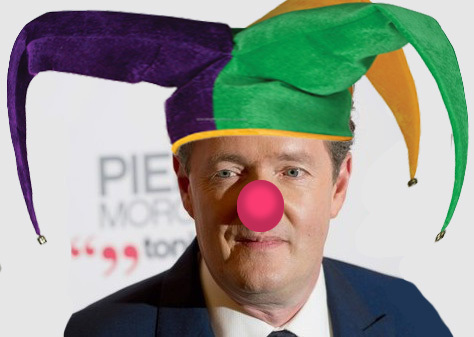 After he indulged his latest shoutfest and bout of name calling, Morgan has shown that he is no more serious as a commentator and interviewer than the syndicated tabloid talker. Jerry Springer made himself famous for screamfests, fist fights, and name calling on his daytime TV show but who cannot see that Piers Morgan is only a few steps removed from Springerism? Take Guns in America as only the latest example. Morgan sold the show as a “townhall,” a meaningful discussion about the “crisis” of guns. Instead of a meaningful discussion, however, Morgan screamed at guests, called them liars, cut them off from speaking, and generally acted the bore. All it would have taken for a full Springer experience is for a chair to be thrown by a baby momma or two. Sadly, this is what Piers Morgan has devolved to. And last night wasn’t the first time Morgan indulged this sort of ignorant behavior. Only hours before his “special” he called a guest a “unbelievably stupid,” and on Tweet after Tweet he’s name called and acted the child. Of course, Jerry Springer was himself the new kid on the block once. Springer took over for Morton Downy Junior, who became famous as “Mort the Mouth,” and pioneered the sort of raucous, confrontational TV that Springer inherited. Morgan’s one thrown chair away from completing the transformation.